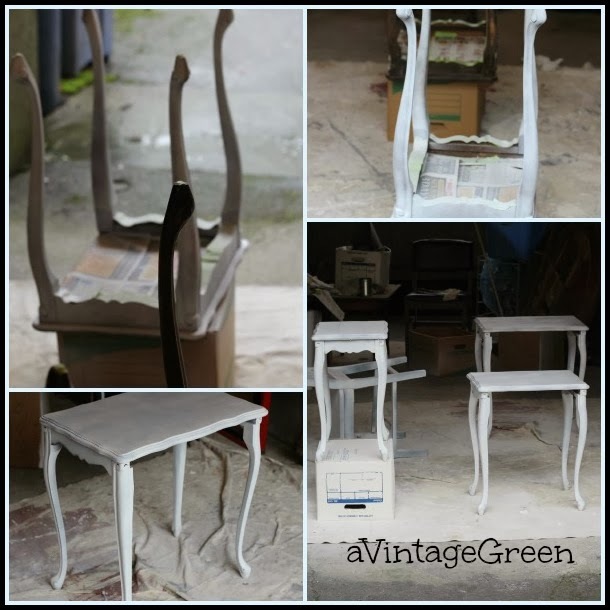 Vintage shabby chic stacking tables. 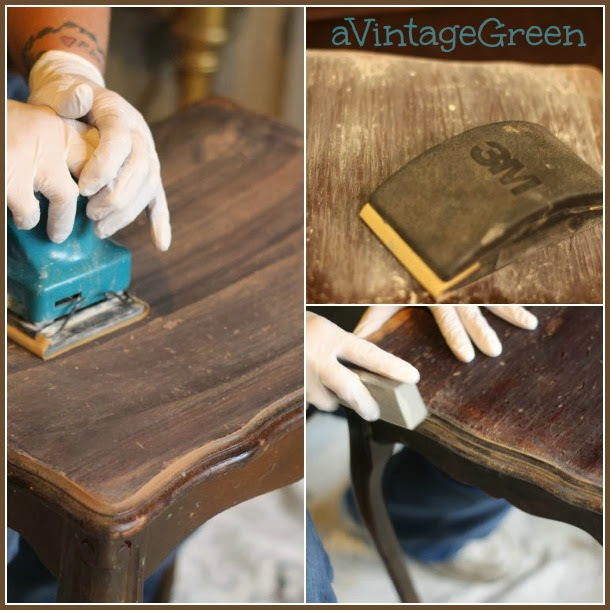 Sometimes pieces of furniture that have been in storage need a new look. The largest had been used for years as a chair side table in the living room but finally got supplanted by a new to us quaint old table with a shelf. The snack table has been hiding under the table in the corner for some time. The next two smaller tables lived in the attic until the roof was replaced in 2007. They migrated to the shed deck. Not a good place to store anything wooden. 2013 they made their way back into the basement. The finish needed to be removed, too many scratches. This is my first attempt at sanding a dark finish (the hands belong to my friend J who was visiting and helping). The tables needed a primer that would cover dark wood so I used Kilz and ... learned a bit more about NOT overspraying an area. Bumpy. I brought the tables into my 'kitchen painting area'. Two coats of CeCe Caldwell Chalk-Clay paint. Things were looking just fine. The finish I chose was MinWax Polycrylic. Looked ok going on. Put a 2nd coat on the top. Dried overnight. Good hard surface but not the look I wanted. Too much shine. Likely more changes sometime in the future. Joy - What a change. Those are really pretty in white! You did a great job!! These tables look great and would have a place in my home for sure! You really do have a great eye for painting furniture. Thanks for linking to TTF! Your stacking tables are just beautiful! You did an amazing job transforming them. I am visiting from Feathered Nest Friday, and just became your newest follower. I invite you to follow me back at Maddiebellahome.blogspot.com so we can share our creativity. Why don;t you apply wax onto of the poly. it will soften it . Love the tote in the last post! I am going to do drop cloth tablecloths with that stripe for Christmas! 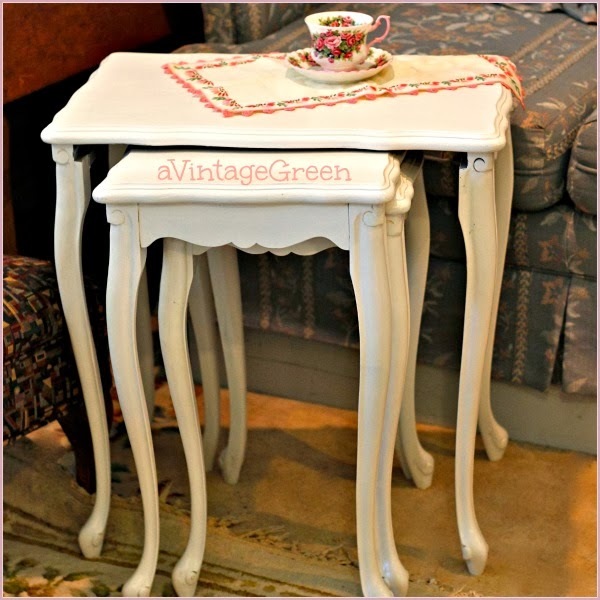 Love Love Love these tables...but you know I would! Just the most versatile little table set in the world...so pretty what you did! Super change...off to the booth??? Gorgeous, gorgeous, gorgeous :) If you have a minute, stop by and share at my new link party, Everyday Vintage. Your style is the perfect fit. Would love to see you there! 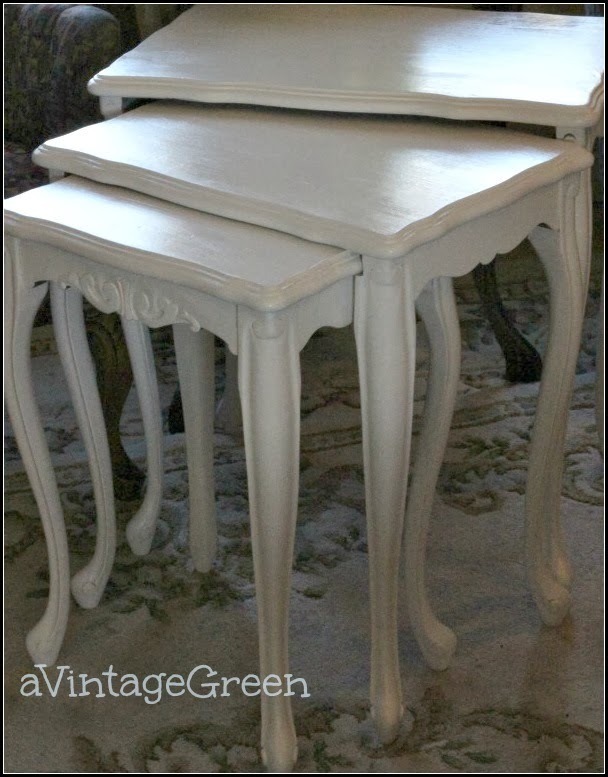 Beautiful tables, they look so pretty in white. Wow, these turned out beautiful! I love the white! Maybe a soft sanding with steel wool would take off a bit of the shine but leave the protective finish intact? So glad you rescued them from storage, they are too beautiful not to use! Love the new finish on the stacking tables. The tables are great because they are space-savers too. Great job! Pretty shaped tables! The new finish is lovely on them and glad they are being refinished. Have a great week! My grandmother used to have some beautiful stacking tables just like yours! I wish I had them so I could do this project--it turned out great! Thanks for sharing this at Frugal Crafty Home Blog Hop! Oh these are so lovely - what a beautiful transformation! But I love them just the way they are! Somethings Old, New, Green, Redo! An ever expanding collection of beautiful and vintage items started my small business in a beautiful space in an antiques and collectibles mall called Village Antiques Mall in Fort Langley, BC. 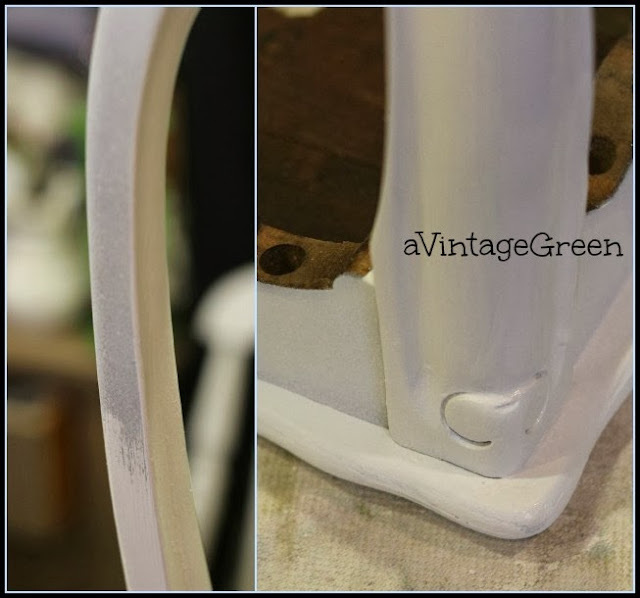 My booth space is called "A Vintage Green". I'm a Writer, Yes, I Am! This blog does not have any advertising or cookies. Photos and Text, A Vintage Green, Joy 2009-2019. Simple theme. Powered by Blogger.